Well it’s been a busy couple of weeks getting ready for the events we have coming up in September. Starting with the Great Yarmouth Maritime Festival, which promises to be a really good one (fingers crossed the weather is good too!). Staff in Education and Outreach have been carrying out research into Great Yarmouth citizens during the First World War. We will have two examples of men who lost their lives fighting in the trenches and are commemorated on the War Memorial in Great Yarmouth. In addition, we also have a very detailed letter from Will Copeman, talking about bombardment from the air in Caister-on-Sea, and papers relating to conscientious objector, Robert Artis. For children, we have two activities, one in which they will have the chance to make poppies out of tissue and crepe paper and pipecleaners. 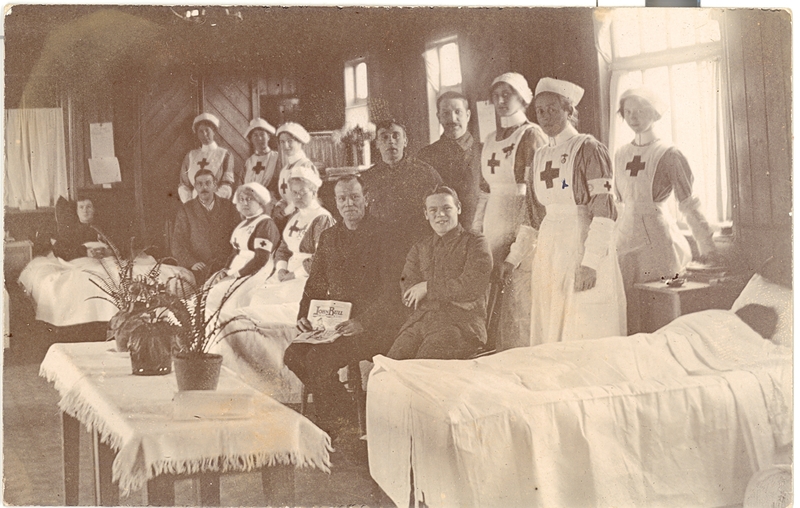 The other, in which they have the chance to become a First World War nurse or solider, by becoming part of a giant copy of a photograph taken in Kirstead Hospital in 1915. Kären (Education and Outreach Assistant) and Gary (County Archivist) will be there on the Saturday and Liz (Archive Specialist) and myself will be there on the Sunday. We hope to see you there. This entry was posted in Events and tagged children's activities, conscientious objector, First World War, Great Yarmouth Martime Festival, Great Yarmouth War Memorial, letters. Bookmark the permalink.